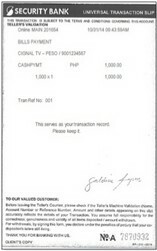 Present the Cignal Statement of Account to the Security Bank Teller to initiate the transaction. If Cignal Statement of Account is not available, please provide the Cignal Account Number (click here to know your account number) to the Security Bank Teller to initiate the transaction. Note: Security Bank payment slip not required. Once payment is processed, Security Bank Teller will provide a validated transaction slip. The validated transaction slip will serve as proof of payment.